ShadowProtect ($80, 30-day free trial) is a physical or local network backup and system restore solution, and it's all included in the program: no monthly fee or service is required. 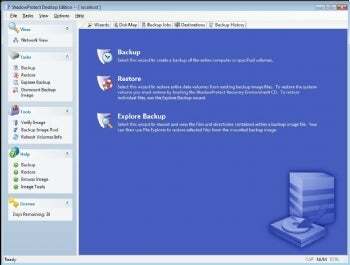 It has a friendly user interface: Within a couple of clicks, you can set up a recurring backup or even an incremental one, and you don't have to close any running programs to do it. ShadowProtect runs in the background, and unlike, say, a virus scan, it doesn't slow the system down much or take up much CPU. ShadowProtect supports "bare metal" system recovery, meaning it can restore one backup to a completely different drive on a completely different PC, if necessary. Note that you must have backed up with ShadowProtect in order to use it for system recovery.